This Kale Caesar Salad is one of my favorite go to recipes. I make it at least once a week because I crave it all the time! The ingredients are completely clean and guilt free! Not only is it super healthy, but it fills me up and tastes sooooo good! I love kale because it is so nutritionally dense. It's filled with fiber, antioxidants, iron, calcium and more! The pumpkin seeds add a bit of a "cheesy" flavor in the dressing, which makes this a great dairy free alternative! The garbanzo beans almost act as a healthy crouton alternative. Rinse the garbanzo beans and lightly sprinkle with garlic salt. I have been obsessed with my air fryer lightly, so I cooked my garbanzo beans in there for 15-20 minutes, shaking occasionally. You can also cook them in the oven at 375 degrees for 45 min or until crispy. While the garbanzo beans are cooking, wash and dry the kale. Rip the leaves off of them stem, and continue ripping into small pieces. Place all of the ingredients for the dressing in a food processor (or a blender of choice), and mix until it is completely smooth. I put my dressing in a jar so I can save any left over for the next day. 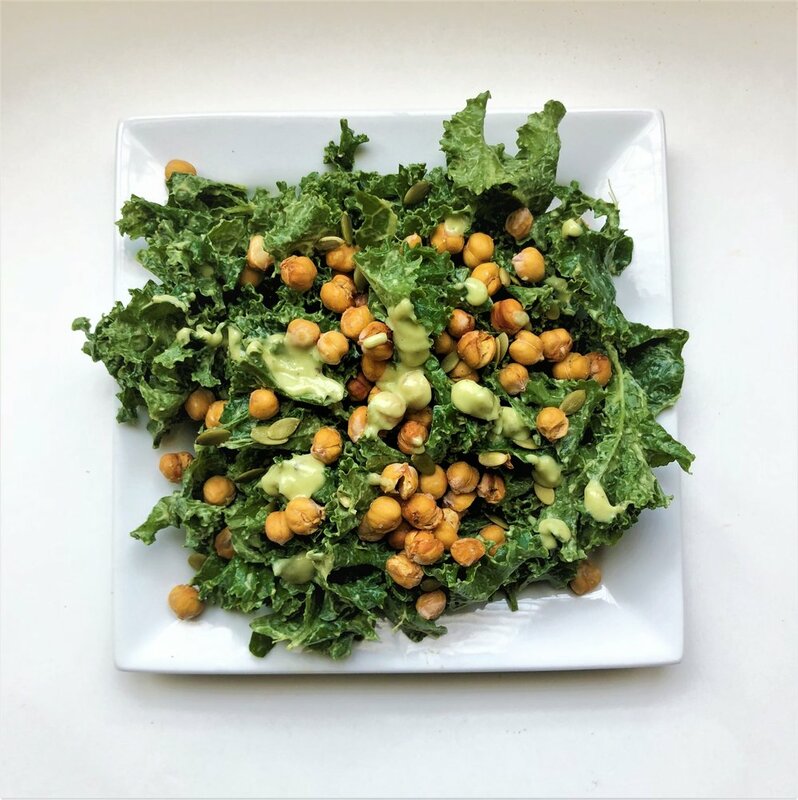 Put the ripped kale in a big mixing bowl and lightly massage in a few tablespoons of dressing. Mix in the garbanzo beans, and pumpkin seeds. Transfer the salad into serving bowls, and drizzle a little extra dressing on top of each salad.